CHECK IT OUT! The Kids of the Southwest II DVD is here and available for purchase! Check back for new releases. >> Please note, if you would like Express Shipping you will need to contact us directly by clicking here. Kids of the Southwest I is the first of several DVDs showcasing kids from several communities enjoying the outdoors. This DVD follows the DRKYHC Pro Staff Team Chase Kemp, Scott Wagner, and Roger DiCamillo as they reminisce about past hunts. Watch as they take 18 excited youth to the lake for their first bass fishing tournament then ride along as they journey through New Mexico, Texas, Missouri, and Arkansas in pursuit of some trophy animals. 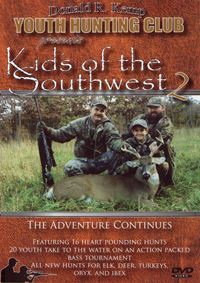 Kids of the Southwest II continues with more of the same thrilling hunts featuring kids from around the Southwest. Join he DRKYHC Pro Staff Team Chase Kemp, Scott Wagner, and Roger DiCamillo as they try and keep up with several excited youngers on hunts and fishing trips to Arkansas, New Mexico, and Texas. This DVD also features special bonus footage of a young hunter guiding an old friend on a memorable Mobility Impaired Antelope hunt.